Lake Show? More Like The Fake Show! 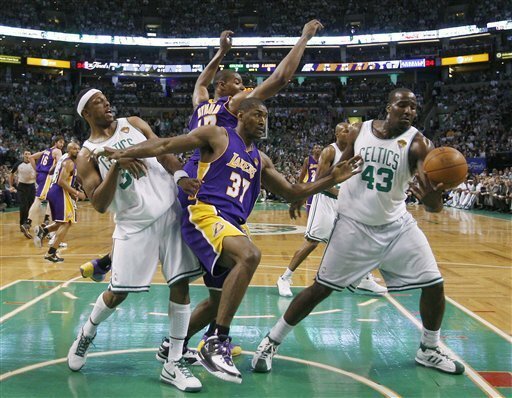 'Bynum' and 'Artest' apparently thought they'd use their dance training for this gig. NBA analysts who said that the Lakers didn’t show up to Boston, after watching L.A.’s third loss to the Celtics Sunday night, may have been more correct than they thought. Hollywood insiders are reporting that several Laker players hired stunt doubles to play in Games 3, 4 and 5 at the TD Garden. 6’10” African-American male, versatile, must play with no heart. Think Mr. Kardashian. @BigBeng28: Lets see if da Mamba can do it alone lolz! Ironically, Derek Fisher wants the real Pau Gasol to stand up. The world will find out if the real will Lakers return tonight at 9pm Eastern, when the NBA Finals resume with Game 6 at the Staples Center, on ABC. But if the Lakers even the series at three games apiece, fans and analysts will still wonder if Games 3, 4 and 5 were the Lakers’ version of the Boston Tea Party, in which they posed as the Western Conference Champions and dumped their chance for glory into the harbor. Tune in to find out. Next: At Last! A New Basketball Comedy!